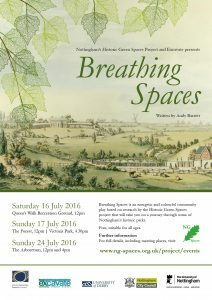 Breathing Spaces is a community play, specially commissioned for the Green Spaces project. It is written by Andy Barrett, Artistic Director of Excavate and will be performed by community actors and members of the Friends groups and other organisations associated with the project. It is based on the research done by the academic project team and the community partners during the original ‘The Social World of Nottingham’s Historic Green Spaces’ project (2013-4). 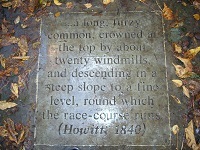 In 1845 Nottingham was changed for ever as land was enclosed and the city finally began to expand after years of overcrowding, death and disease. And as a part of this transformation the ‘green lungs’ of Nottingham were created – a series of walks and parks that remain in place today. Come and find out more about this historical moment, and of the ways that these Nottingham parks have been used throughout the ages in a lively new promenade performance that will take you on a journey through these last remnants of Nottingham’s common land. With live music, unexpected encounters, and a host of characters from across the ages, this highly visual performance lasts around 70 minutes, is suitable for all, and is free. Simply turn up on the day. 16 July 2016: 12 noon – 1.30; Queen’s Walk Recreation Ground – the performance will be followed by some ‘Victorian Children’s Games’. As this is a promenade play, the action will move from place to place, across the parks.